If you are a regular reader of my blog you know just how disappointed I was with the program part of our ceremony last year, therefore this year I was on a mission. I searched Pinterest for ideas and saw the color scheme My Co-Leader and I love! 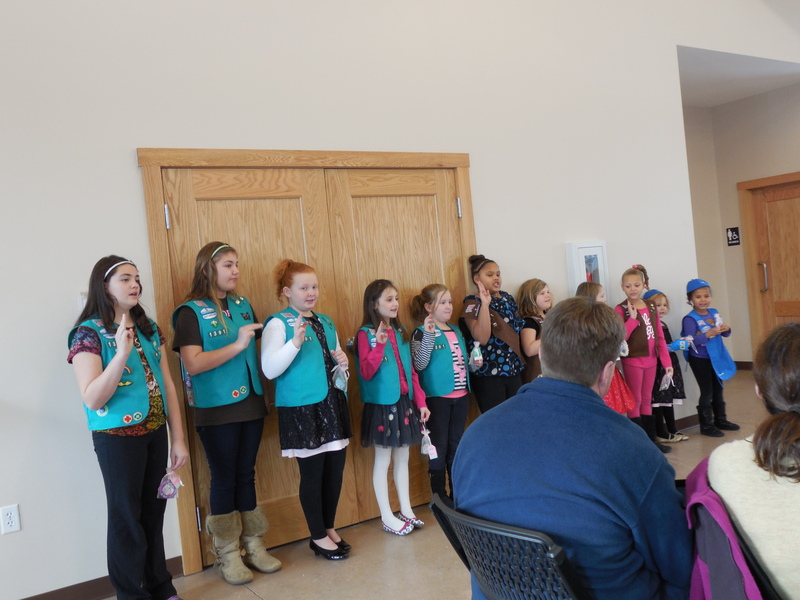 Then the hard part LOL I sat and thought about everything….Our Troop has three levels and we have new girls I saw nothing that appealed to us in a traditional ceremony. Therefore, we had a Scout’s own or Leader’s own either way you look at it, it embodied everything our Troop is. Next, I had Ms Erin call the girls to Re-Dedicate, I called the girls to Bridge (My 4th grade Pea included!) 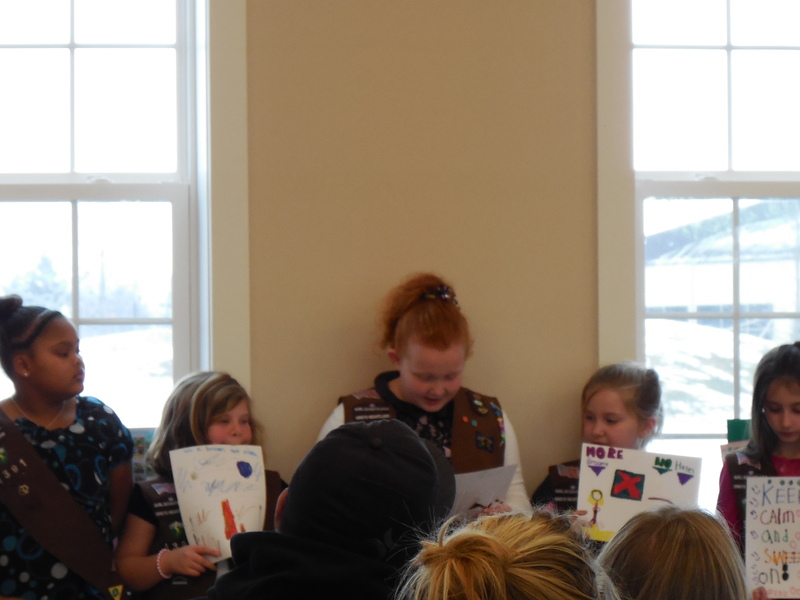 and as much as I wanted to call over the new Scouts I had Ms Erin do it, my youngest Pea was among the three and I would have lost it…that being said I will admit I read through a script a million times that I wrote for the whole program, and I still read it off the paper. NERVES! Once this was done, we called over the girls who where Re-Dedicating, gave them their patches and had them move over to the Friendship Circle, the same with the girls who Bridged and finally the girls who Invested. 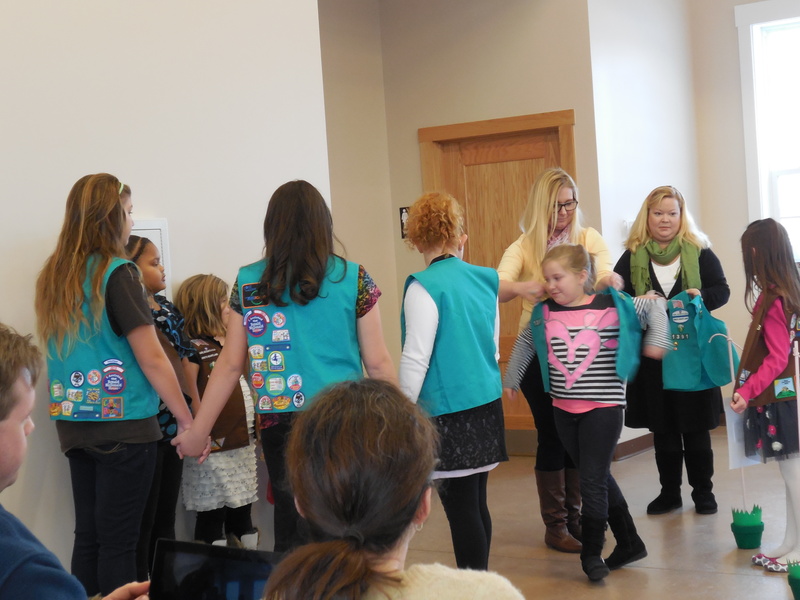 Since I had a new Co-Leader this she Invested too, the Leaders then joined the circle and sang the whole Make New Friends song not the short one we do in the meetings! 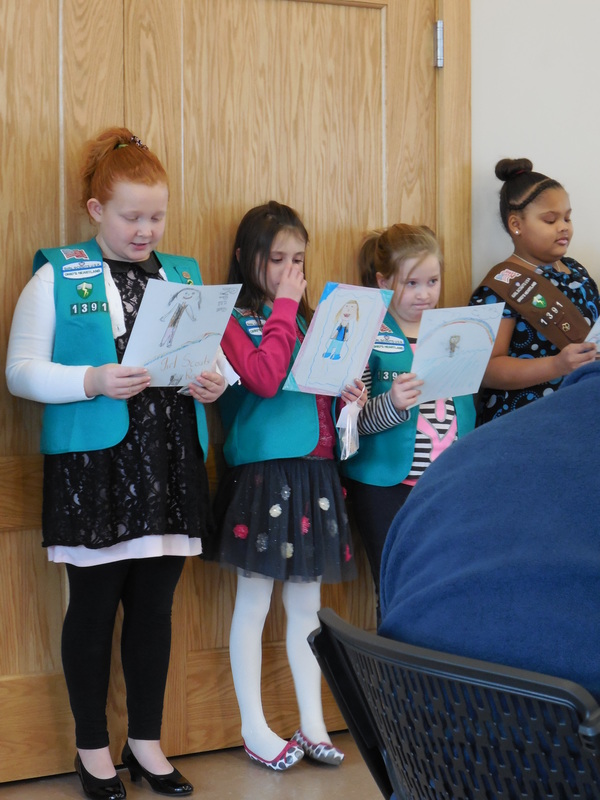 Then we had the girls read out loud what they loved most about Girl Scouts I had them write this out along with a picture of themselves in uniform at one of the meetings. I taped them together so they could show the picture while they read, after the were done they took the picture to their family, gave hugs and came back. 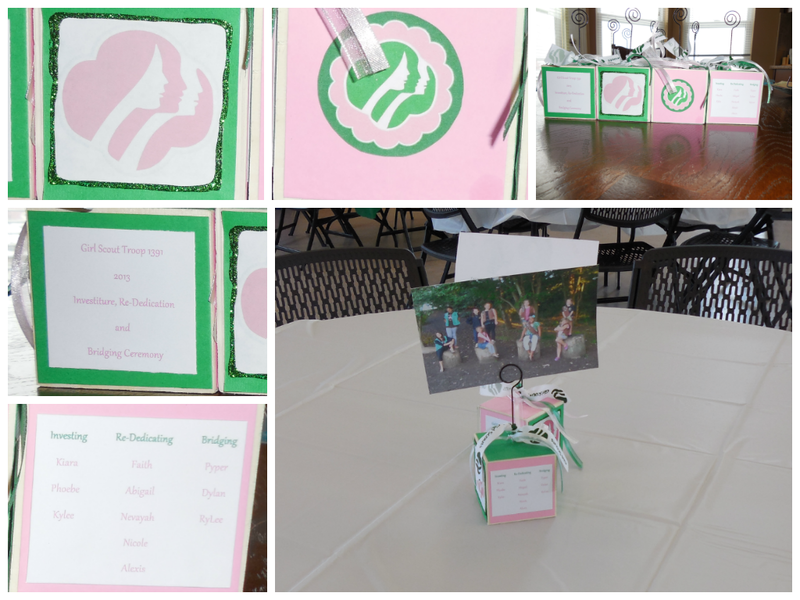 I used a lot of the print outs from http://www.birdsparty.com/ she was nice enough to create a pink and green Girl Scout theme that my co-leader and I fell in love with! 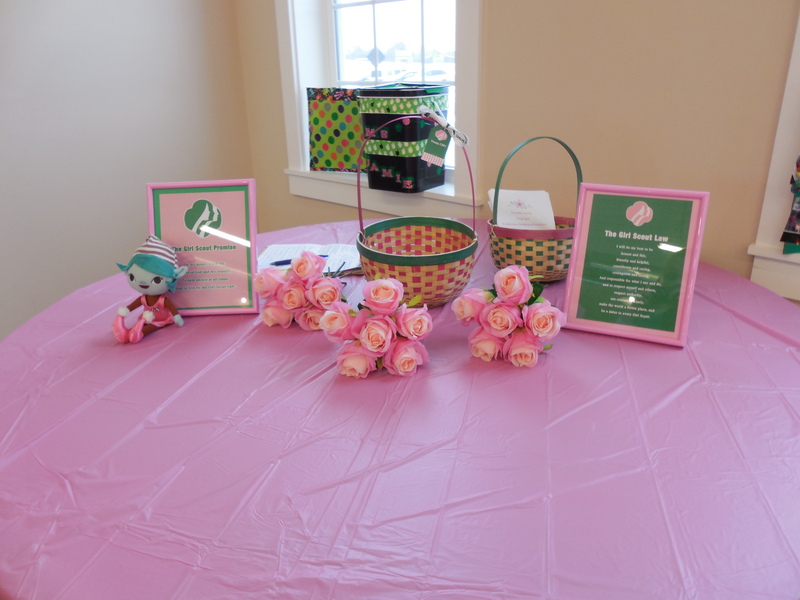 We used all green, pink and white table clothes to match then I used Bird’s creations to make photo blocks (from Oriental Trading Co) I used her print out for two sides, used the same pink, green and white card stock and printed out our girls names and the occasion for the other two sides, added ribbon and that is what was used as center pieces. I had taken pictures when the weather was nice and we were meeting at the park, (our Daisies got their own since they were not in the troop yet) so we added those and that was the take home gift. 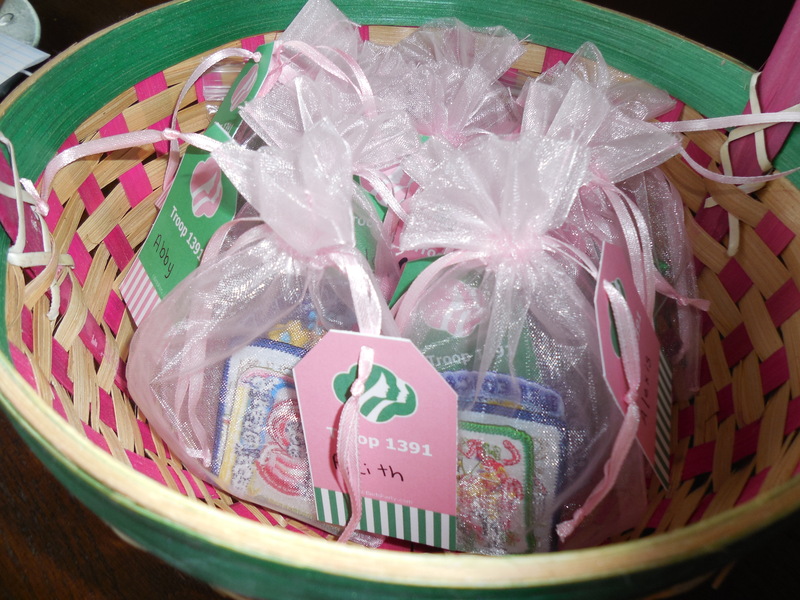 We put their patches that they had earned in little organza bags and used tags from Bird too! We placed them in my girls Easter baskets that just happened to match! 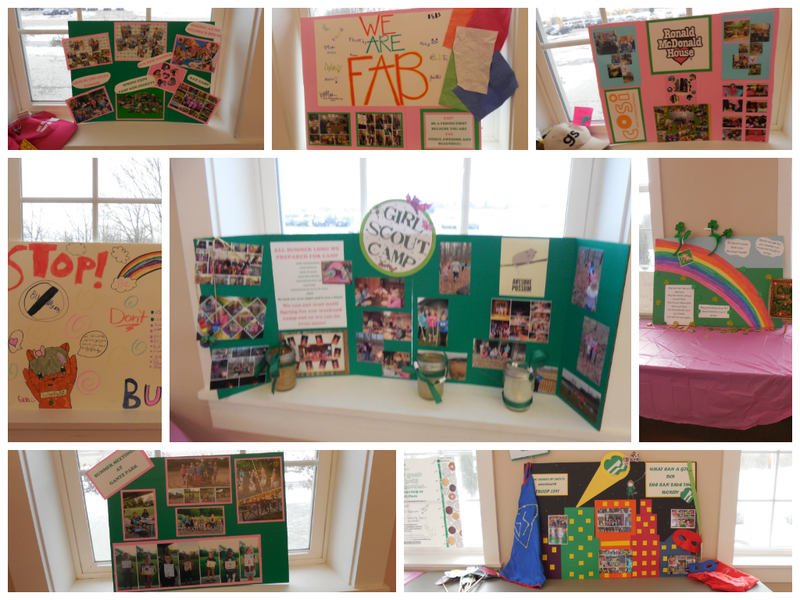 Now the most time spent on the decorations….I made posters to showcase almost everything we had done in 2013 for all the families to see. I will be honest I did not sleep at all the night the night before the ceremony, I made a ton of posters and it took forever so you may want to start more than a day ahead of time (-: ! Here is just a few we were so lucky that the place had so many windows we put one poster in each one! We even had our posters from the Booth sales we had to showcase the one we did win the Bling Your Booth Contest after all! We also made our own bridge I used the same flower pots from last years and put foam in them I spray painted dowell rods pink (in a snow storm yes that is dedication!) 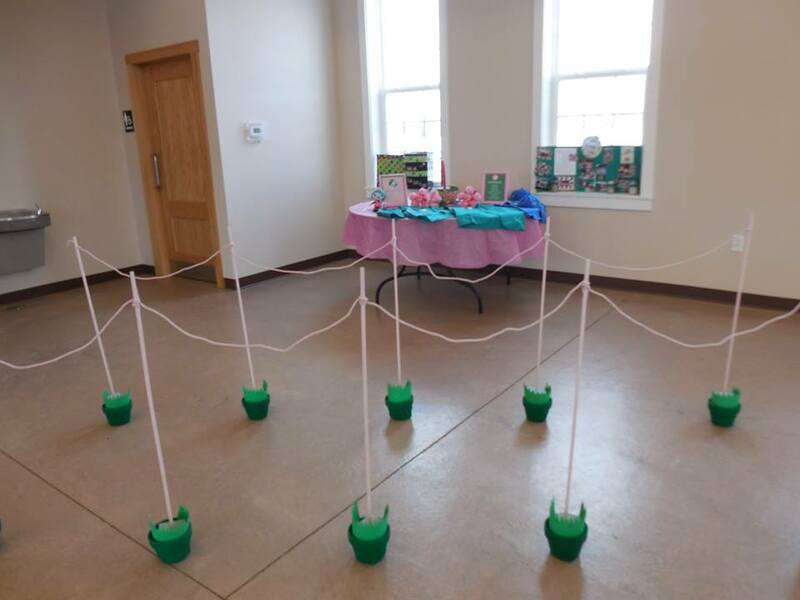 and I dyed rope with jello to make it pink, used card stock to make grass and constructed it at the party center. I loved Bird’s Law and Promise print out as like others before I framed them for our table up front where us Leaders stood for the program. Last but not least I made the programs Program you can open it here if you would like to change things around and make it your own (: Just copy them onto two sided paper, or print out as two sided and fold in half add a ribbon if you like make it fancy! My Co-Leader loved the photo booth I did last year and wanted to do it again. So she got the cutest polka dot material and we used the removable hooks and put it on the closet door. I brought last years props, and she made brand new ones for the girls. It’s always fun! (our bat is an homage to our camp out)! We had asked that our parents bring two dozen cookies, we had a sign up sheet to ensure we didn’t get nothing but chocolate chip LOL ! We made sure the ceremony was not at lunch time we made it at 2:30 so that the girls would have already eaten. Here is just a few more pictures of where we had it, The Eagle Pavilion at Rotary Lake it was snowy and beautiful! 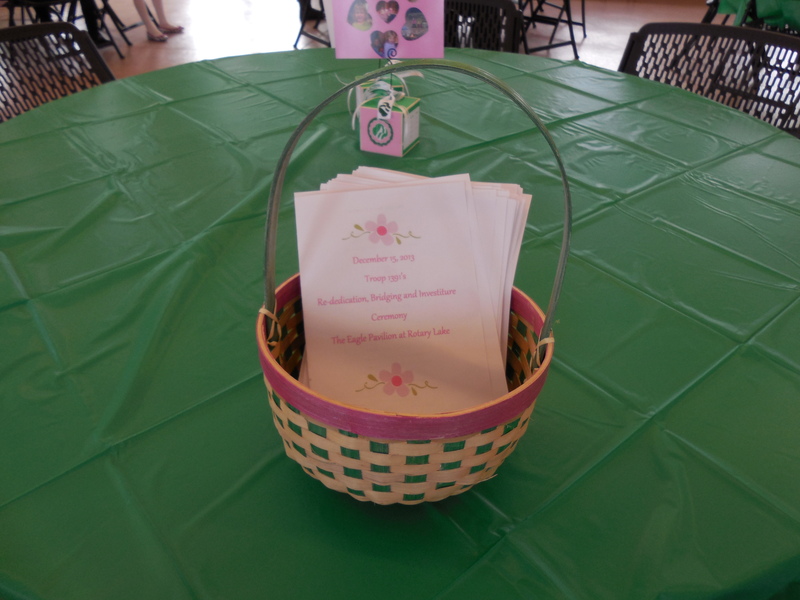 Thank you Bird’s Party for your printables they were gorgeous! Now to start thinking about 2014! 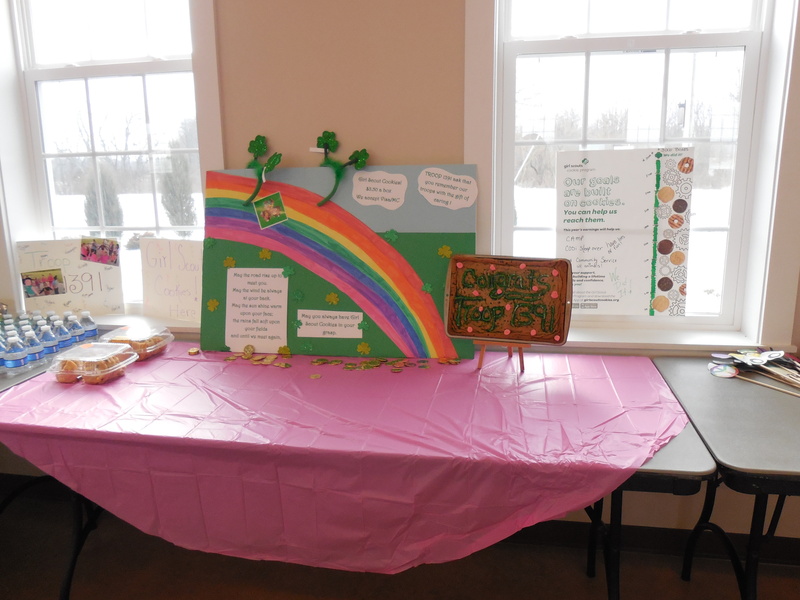 This entry was posted in Girl Scouts, Girl Scouts Troop 1391 and tagged birds party, bridging, brownie, daisy, girl scout, girl scout ceremony, investiture, junior, pink and green girl scout, re-dedication, troop 1391. Bookmark the permalink. 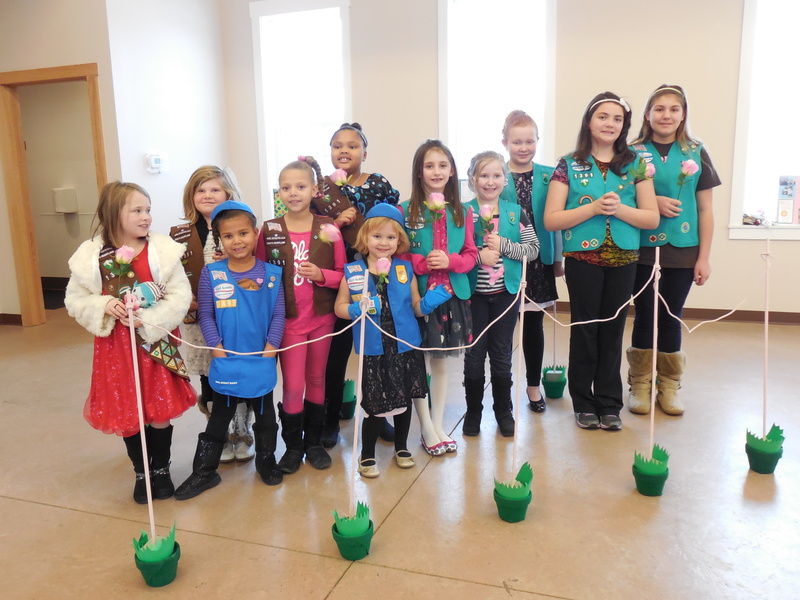 ← Girl Scout Walk About – Lanyards! 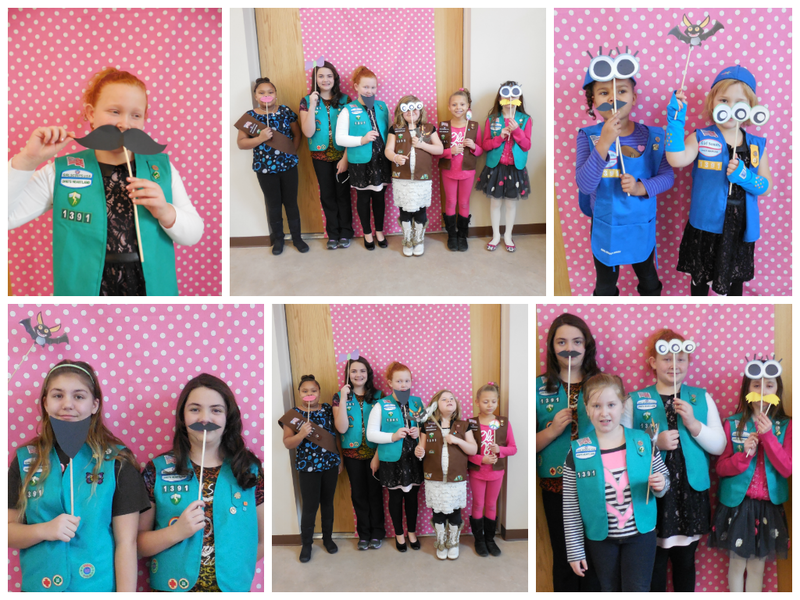 I am a blog follower so I read your last investiture post and I love what you did this year it looked beautiful! On that note I thought you did a great job last year too. You are way to hard on yourself missy! Love your blog! I see so much of it on Pinterest I hope you’re getting the credit you deserve!! 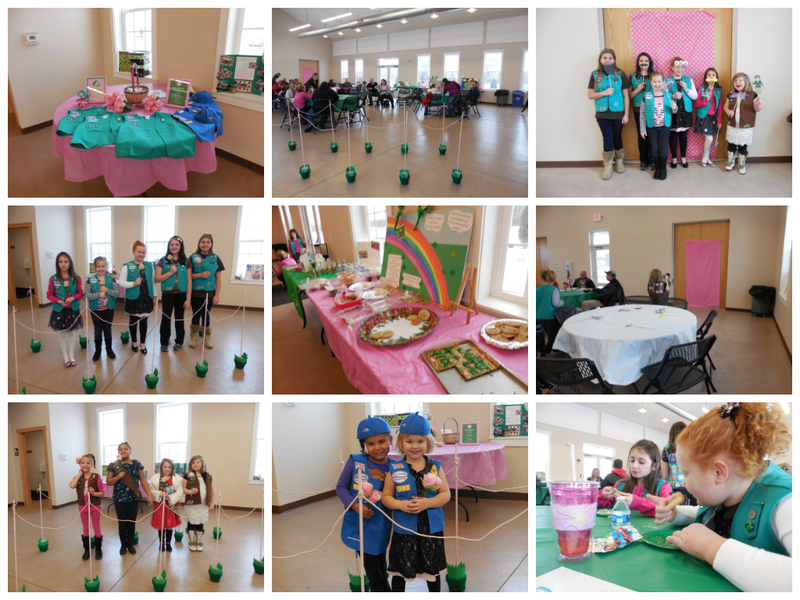 I’m working on a website for Girl Scout troops. You sound like you’re totally organized and may not need help keeping parents organized/informed, but please check it out and pass on the link to any other troop leaders in your Service Unit. 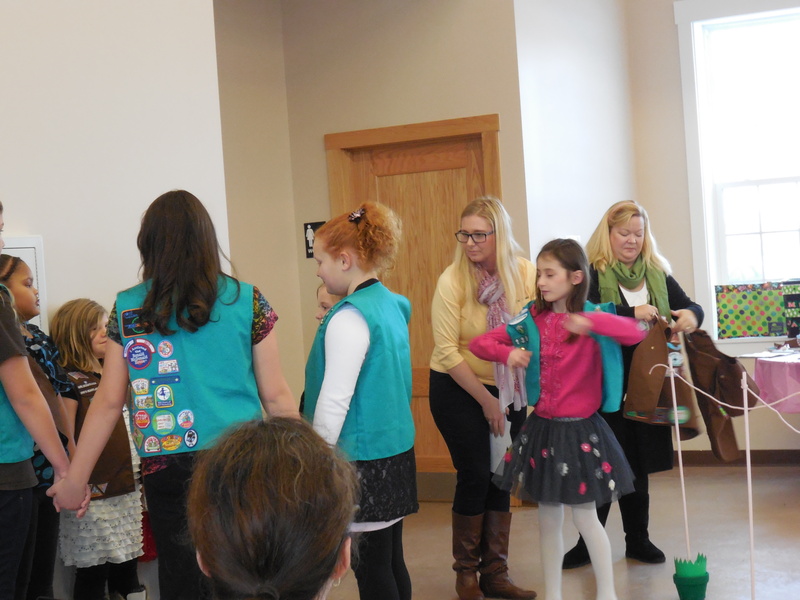 I’m not an active troop leader anymore but I loved Girl Scouts (that’s why I wanted to create the website). Your posts help me remember what it’s all about (the GIRLS!). Thanks! Even if you don’t use it, I’d love your feedback on what seems useful or is missing. 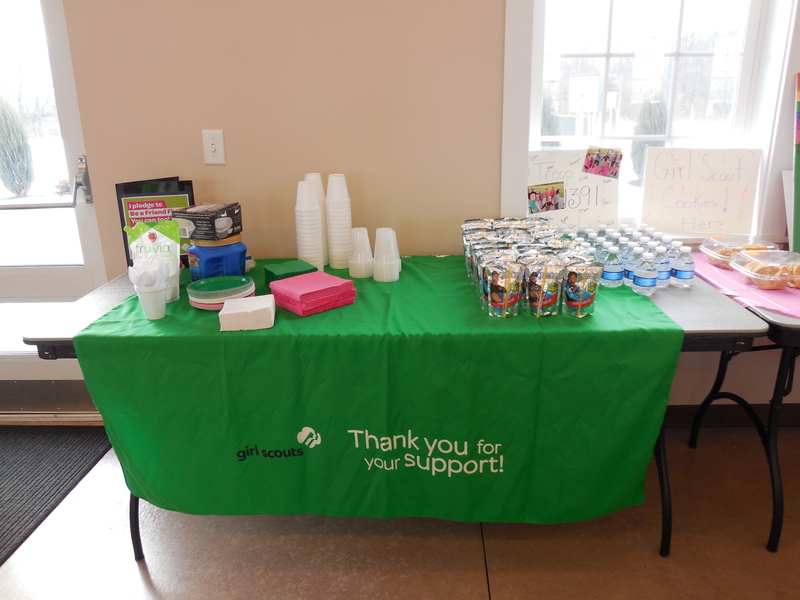 I love Girl Scouts and want to support troop leaders. In case I messed up the website, it’s http://www.thetroopsite.com. I’m a newbie at WordPress and am learning. 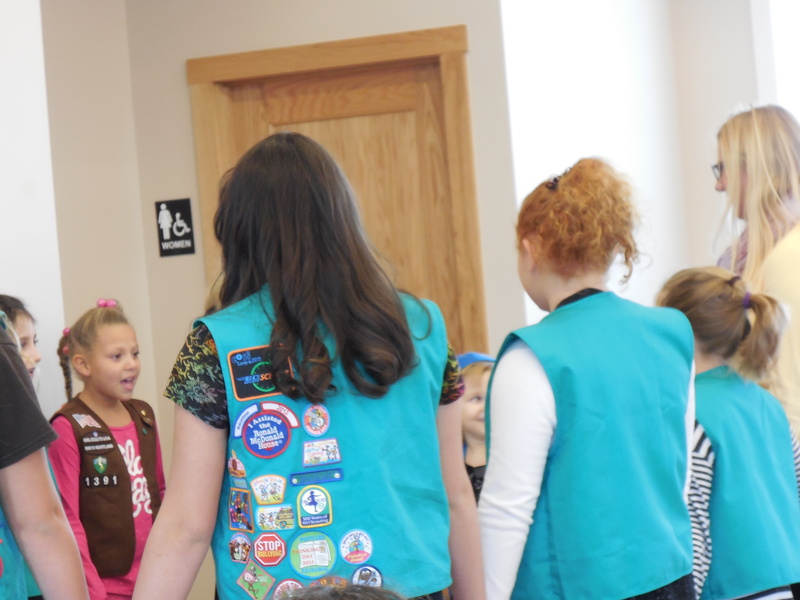 Hello, I happened to stumble upon your page while looking up girl scout leader blogs. I am wondering if you have any tips for combining troop levels. I have 1 kindergartner this year, 2 first graders, 5 second graders and 3 third graders. I am having a very hard time combining the Daisies and Brownies and have no idea what I’m going to do with juniors, brownies and 1 daisy next year! Any help would be greatly appreciated! Andrea! How am I just seeing this comment!